There are low moments in a trekking holiday, like in any other vacation, that tend to get glossed over in the adventure's afterglow. After a couple of sweaty days on the trail, one begins to wonder, for instance, if showering is really so important after all, or if feeling the pain of a new gluteal muscle every few hours was really the most relaxing choice for this rare full week off work. Wouldn't you be better off soused, lying in the shallow waters of some benign island? Or running with the bulls? But then, of course, there are the moments that are better than anything you could have expected. The Annapurna Sanctuary trek in central Nepal follows a milky glacial river through a Himalayan valley of vertical rice terraces and bamboo forest. The goal is Annapurna Base Camp, the starting point for serious climbers attempting Annapurna I, the world's 10th highest peak. But at 4,130 m, base camp is a destination in itself  and after three days climbing uphill under a 40-liter pack, you begin to wonder if you're ever going to reach it. Dal bhat, the traditional Nepali dish of rice, lentils and curry and the trail food of choice among backpackers, guides and porters, is the perfect cocktail of carbs and protein to fuel your ascent, but the no-nonsense grub does little to quiet the pangs of self-pity that kick in at the end of a long day when you know there's more to come the following dawn. Enter the sweet side of globalization. 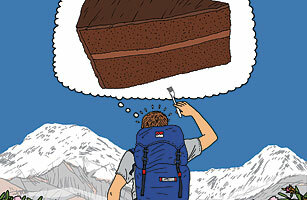 On a stone terrace in the hillside hamlet of Chomrong, the last inhabited village before the path moves into oxygen-deprived altitudes, hikers from Tennessee to Estonia throw down their poles and packs to take part in a confectionary rite of passage: chocolate-cake consumption. The congenial owner of the Chomrong Cottage Guest House, a Tibetan-Nepali woman whom the local guides and porters call "Didi," or sister, has become a legend for the magnanimous slices of warm, brownie-like chocolate cake she serves weary hikers going up to or coming down from base camp. (She also makes giant California-style burritos and a mean yak-cheese pizza.) The cake is delivered on a plain white plate and is enjoyed quietly, between groans of appreciation and slurps of tea. The sugar rushes into your bloodstream while the lactic acid drains from your quads, and suddenly, with the day's hard work fading into the background, there it is. For the first time on the trek, the brilliant white bulk of the mountain comes into full view, presiding over the shared ritual of hospitality and gratitude that is as old as the storied peak's Sanskrit name  Annapurna, or literally, "full of food."